I’m going to be running Motobushido at Endgame to celebrate the reboot of Road Warrior on the 16th of May and I am very excited! Here’s my blurb. A new ruler has risen in the land, vowing to destroy the motobushi forever. Skirmishes occurred throughout the Spring, and in high summer your pack suffered defeat at the Battle of Little Town. Now it is autumn, and your much diminished pack, along with remnants of other motobushi packs – including your hated rivals the War Pigs – have been driven North into the mountains. A meeting of the packs has been called at Three Peaks caverns, and you have been sent as your pack’s representatives. The survival of your pack, and perhaps the Motobushi tradition, is in your hands. For this second Motobushido game I am going to do a few things differently than in my previous one. I’m going to run the First Founding this time. 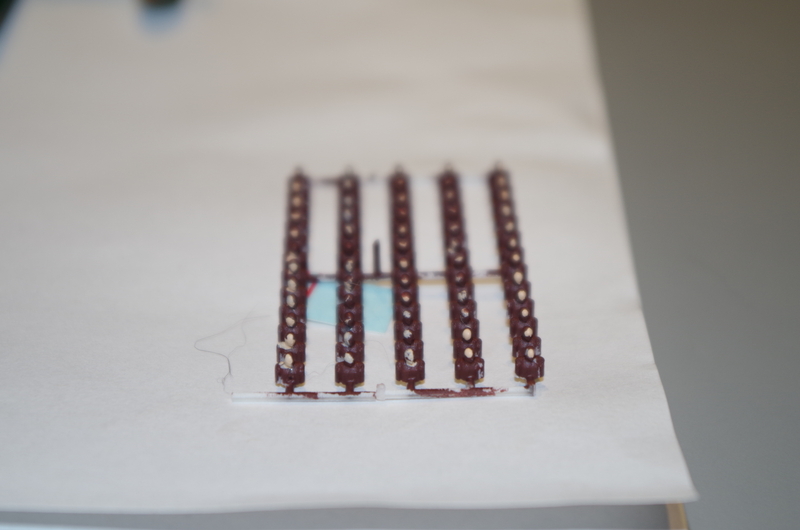 Last time I skipped it due to concern over time constraints, but I discovered when I ran that I certainly could have fitted it in had I wanted to. I think it is a good way for players to learn the system, so I am going to use it this time. Characters aren’t going to be 1st Rank. For campaign games that’s great, but for one-shots the 1st Rank powers are not the most interesting and don’t necessarily highlight each class to it’s best effect. At the moment I am considering exactly how many advances I want to give each character, but it will be somewhere around 6 spit up various ways between Pack, Sword, and Highway. Once again I am very excited to be running this innovative and evocative little game. Well, here I am – your beautiful Maryam, only a few days at the front and already in the hospital. You did tell me it would not be like crop dusting. The 588th is a truly amazing unit, and a tribute to what women can accomplish when we are given our freedom. We attack the Germans relentlessly, fearlessly, constantly. It is our task to support our brothers at the front by never giving the Hitlerite invaders a moment’s rest, a single quiet moment. Always we are nipping at their heels, snapping and biting. Of course I cannot say where we are, but believe me we see constant action. And my sisters in the regiment are simply amazing! Upon arrival, I found myself suddenly thrust into the leadership of a section of aircraft, pilots, and navigators. It was not a role I had expected, but I attempted to rise to the responsibility. I owed it to the amazing individuals I serve with. Since then we have flown many missions. Often we fly several times per night. We take off at dusk, drop our bombs on the target, and return, sweeping down the runway crying “More bombs! More bombs!”. And then we are off again, into the night sky. Often we shut down our engines over the target so that the Germans cannot hear us coming, and sail over the target with no more sound than the wind whispering over the wings. We have heard that the Germans hate and fear us, and have begun calling us “Night Witches” because the they think our aircraft sound like broomsticks. So how did I end up in the hospital? I fear the story is not too dramatic. We we drop bombs on the Germans, and sometimes they shoot back at us. Despite their poor aim, sometimes one or two will get lucky. That’s what happened to me. We were over the target, and had just dropped our bombs successfully, when we were hit by shrapnel from a flak gun. I was hit in the legs and lost consciousness. That would have been the end, but my heroic navigator, Sgt. Teremova, was able to successfully land the plane, even though she was also badly wounded. She pulled me to safety after the landing. I owe her my life. So now I have a little German souvenir in my leg, and a cane to help me get around. But my feet still reach the rudder pedals, and I am anxious to fly again. Now that I have only nine toes, perhaps one of you will finally be able to catch me! 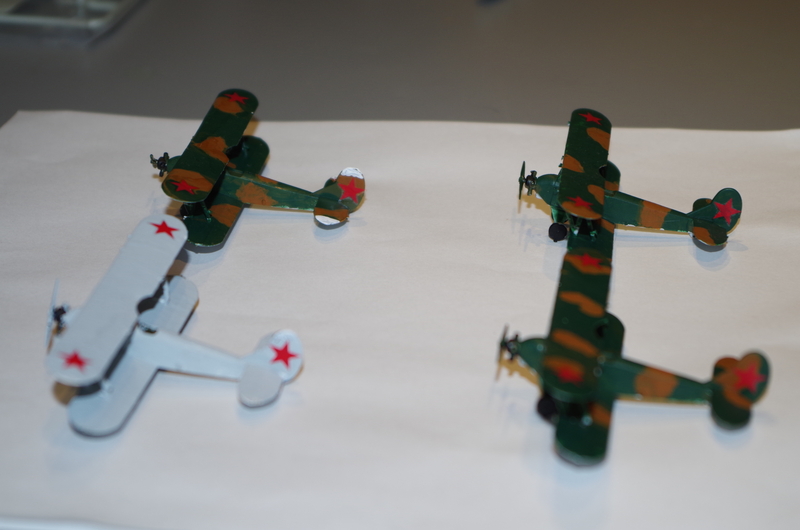 Here are some photos of the Po-2s I have been working on for Night Witches. 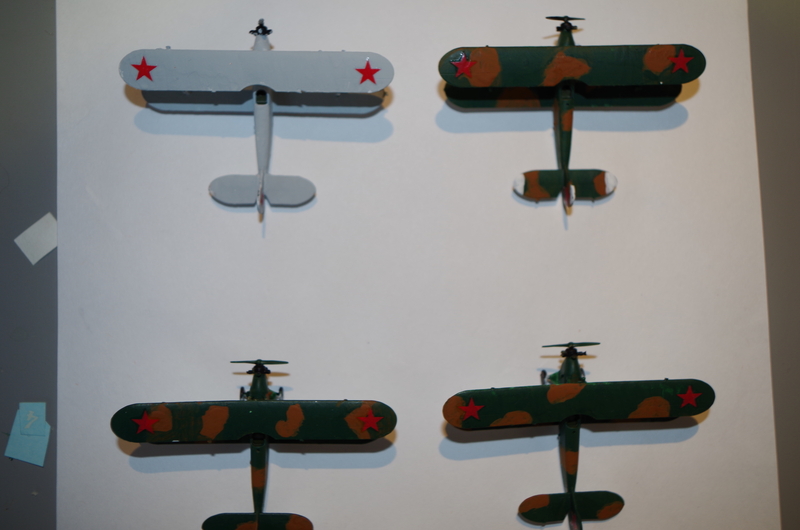 I have them pretty well painted now, and have put the Zvezda red star decals on them. A few things to note about the models – first of all, the size of the decals that Svezda makes for these models seems to be of the wrong scale. You cannot fit more than a single digit number on the tail. I opted instead to put red stars on the tails and not the fuselage because a) I wanted to save the fuselage area for detailing when an aircraft gets a personality, and b) the red star is also rather large, and it wouldn’t fit nicely on the fuselage unless I put it right behind the navigator’s cockpit, which looked too far forward. The Zvezda models do not come with pilots or navigators, but I ordered some 1/144 scale heads and torsos. They’re hard to paint well, but I have enough of them that I just took a quick shot at each, figuring that some of them will come out well. I HIGHLY recommend that if you want to put pilots and navigators in your Po-2s you do it BEFORE you put the upper wing on.